Excellent speech from Rep. Lew Frederick on President's Day rally Feb. 20, 2012. Hopefully his voice will inspire others to stand up for what is right and ask questions regarding SB 1581 and the Achievement Compacts. My children and students thank you Representative Frederick! The following letter, written by Jenn Schuberth of CORE: Calling Oregon to Reinvest in Education, was recently sent to the Oregonian and all Oregon legislators. It was written in response to the latest Oregonian piece that felt the need to advocate for the ramming through of Governor Kitzhaber's education reform legislation, SB 1581 and the Achievement Compacts. By stopping the Achievement Compacts now, we can give ourselves the time to really ask the important questions necessary to develop a well-thought out plan to include everyone's voices. Especially those that have been ignored or dismissed: parents, teachers, grandparents, and students. Oregon has typically been a state that valued its independent spirit, but instead, we are acting out of desperation and following rather than leading the way in developing a quality public education system for our state's children. After all, we still have another year to create a plan we can all live with and be proud of as the 100 percent requirement doesn't take affect until 2014. Isn't it worth it to slow down, think, evaluate, and do this right? One thing is for certain, not all parents and educators buy into the Achievement Compacts. Read Jenn Schuberth's letter here first. Add to her voice and ours at Oregon Save Our Schools by contacting your legislator this week. Your voice is important and every voice does count! "If You Question the Governor’s Education Plans, You Hate Children and Want Oregon Businesses to Fail"
I’m a parent of two young children and a professor at a public university who used to work in finance. I’ve urged legislators to vote against the governor’s education bills for economic and moral reasons. Economics first. We don’t need to define “outcomes” using achievement compacts, we need to increase input, that is, funding. Major business organizations and the governor say we don’t have the money and we must cut costs, but that’s simply false. “We,” as in the state of Oregon, are doing very well. Oregon’s economy is growing much faster than the national average and was second in the nation in economic growth from 2000-2010 (OCPP, “If Economic Growth Assured Well-Being, Oregonians Would be Thriving”). “We,” the general public, have created, but not benefited from that growth; our paychecks and tax revenues continue to shrink. The money is in Oregon, it is being hoarded by certain businesses and individuals. We need to stop believing the business-as-job- creators myth and start asking businesses and wealthy individuals to pay their fair share. I am also against these education bills from a moral point of view. Your editorial urges passage of these bills because Oregon needs "better-educated, better-prepared, more-productive workers." Most people don’t think of themselves as “workers,” but as human beings and citizens who work to make a living. I applaud the Oregonian’s honesty in explicitly stating what these education bills are designed to create: workers. The OEIB’s reform agenda will lead to more standardized testing and create worker drones, not educated citizens. As University of Oregon education professor, Yong Zhao, explains, “unless high-stakes standardized testing…is abandoned, America education will continue to be ruined by the so-called reformers. In fact, Arne Duncan’s proposal to ‘reward excellence’ …will only increase the stakes in testing” (Ditch Testing (Part 5): Testing Has Not Improved Education Despite all the Costs). The governor’s plan is meant to align with Arne Duncan’s reform agenda and it will lead to more testing. Testing for competencies is not the same as educating citizens. Many parents, teachers, and citizens disagree with these plans and they neither hate children nor business. I urge legislators to listen to these other voices who have real critiques about the education legislation, the OEIB’s direction, and the governor’s myopic focus on “mending” relations with certain business organizations. We need to fund our schools and educate citizens, not create worker drones. Jennifer Schuberth is cofounder of CORE: Calling Oregon to Reinvest in Education and an assistant professor of religion at Portland State University. QUOTE: "This", cried the Mayor, "is your town's darkest hour! The time for all Whos who have blood that is red To come to the aid of their country! ", he said. "We've GOT to make noises in greater amounts! So, open your mouth, lad! 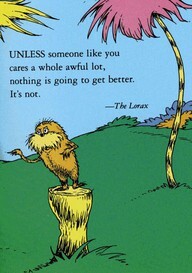 For every voice counts!" I have been a follower of Matt Love's writing ever since I read his book Grasping Wastrels vs. Beaches Forever Inc. which told the true story about how Oregon's beaches became public and saved from being owned by private entities. This book is why I fight so hard for public schools. I am constantly reminded of Bob Straub and how he didn't give up when they wanted to put a highway through Pacific City. Read and watch the video of this story here via Oregon Public Broadcasting. 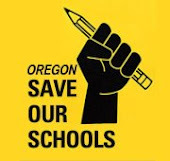 We at Oregon Save Our Schools are the Bob Straubs of public education. We question. We educate. We know there are those who just want us to go away because of those very qualities. However, the take over of public education in our state won't be easy. We won't let it. Come join us on our Facebook page. Start asking your legislators questions. Tell your stories as a teacher, parent, student, and let them know that we will not be ignored. Once public education is gone to the highest bidder, we've sealed our fate. Today in the Oregonian, whose byline should I see on the opinion page? Matt Love: and he was talking education reform! Bob Straub is coming full circle here. We should definitely keep teaching as we know is best for as long as we can, but we also need to step up and ask questions of the decision makers. Oh yeah, if you get a chance to read Matt's book about the beach bill, do. It is a story that would have easily been forgotten, but the lessons from it are long-term and far-reaching. Every time you walk on a public beach you should be reminded of the power of the people and what it can do. Remember that when you look at the fate of our public schools too.